Hotel Heitzmann is a bright and modern family-run 4* hotel based in central Zell Am See, and within a stones throw from Castle Rosenberg Registry Office. The hotel has been organising weddings for many many years, and every wedding couple is assured to receive the best of personal service from Rudi, Anita and their team. A perfect location for those seeking something different. Generally speaking for weddings to be legally recognised in Austria they must take place indoors in one of the stunning civil wedding registry office locations such as this one. We have been planning weddings in Austria for many years and have organised some fantastic weddings at Castle Rosenberg, Zell am See. Castle Rosenberg is within easy reach of all of the hotels that we work with in Zell am See. 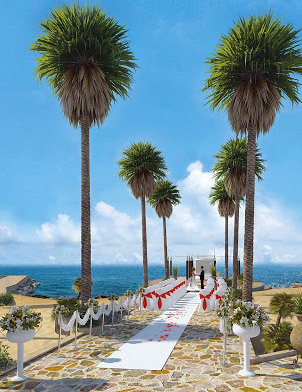 It's also an ideal location for wedding guests staying at nearby cheaper accommodations. It's even within walking distance of Zell am See's main ski slopes and ski lift! Following your Civil Wedding at Castle Rosenberg, Zell am See, Austria you may even want to have your relationship blessed on top of the the Mountain nearby? This is an ideal ski resort wedding, it's an affordable wedding destination for you, and also easy to get to and relatively cheap for your guests to visit too. Please note that the prices of the wedding packages vary greatly depending upon which hotel you decide to stay at in Zell am See. Civil weddings can take place all year round at Hotel Heitzmann Registry Office in Zell am See, so whether it's a winter wedding or a summer wedding in Austria it can be accommodated. If you'd like to discuss the various wedding location options please speak to our Zell am See Wedding Coordinator on 0844 770 8270. In advance of the wedding please bear in mind there are very strict legal deadlines that you must adhere to and also legal costs are involved in this. Including: documents required from your legal registry office, issuing of apostiles at the Foreign & Commonwealth Office (may involve you making a trip to FCO Offices in Milton Keynes, UK), express postage to Austria (depending on how soon you're getting married); please ask for further details. Wedding receptions generally take place in the Hotel Heitzmann's reception restaurant. The hotel even has it's own private wedding reception room where you and your guests can dance the night away, without disturbing others staying at the hotel. There are special discounts for the gala dinner for wedding guests dining on Half Board at the Hotel Romantik. If you'd like to discuss the various wedding reception options please speak to our Hotel Heitzmann Wedding Coordinator on 0844 770 8270..
2012/13 AUSTRIA WEDDING PACKAGES - Call 0844 770 8270 to Book!